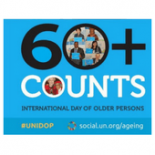 The United Nations’ 28th International Day of Older Persons program, titled “We are the Champions,” called on world leaders and citizens to engage older adults fully in our communities. The session also highlighted the growing number of elders experiencing poverty, isolation, abuse and poor health; they’re especially affected by natural and man-made disasters. Program moderator Craig Mokhiber, Director, New York Office of the High Commissioner for Human Rights, called out ageism as a foundational issue blocking progress. He noted that the UN is increasingly aware of issues related to older adults and specifically included them in several of the 2030 Sustainable Development Goals. However, it has no treaty covering older persons, in contrast to its longstanding focus on other vulnerable populations including women, children and refugees.